Hillary Hahn’s taste for the unconventional has in recent years taken her career onto a trajectory unlike that of most violin prodigies. Last October, she appeared on NPR’s Tiny Desk Concert Series improvising to traditional American melodies that inspired the works of Charles Ives, donning a fedora for the occasion. She maintains an active web presence, blogging and twittering about her life on the road, perplexing critics last year when she posted a Skype interview with a fish on YouTube. Her latest project is a collaboration with the German master of the prepared piano, Volker Bertelmann (aka Hauschka). After playing together at the behest of folk singer Tom Brosseau two years ago in San Francisco, the duo began meeting regularly to improvise and ultimately decided to consolidate their endeavors on a recording with Deutsche Grammophon. The recently-released Silfra, named after an island outside Reykjavik that lies just between the European and American continents, is a collection of non-notated works documented at a studio in Iceland. “We had a hunch,” Hahn said to the audience during a DG “Yellow Lounge “ concert at Berlin’s Club Asphalt on May 10. “We played, then we recorded just improvising together, and now we’re on tour to capture that spirit.” Their next stops include Los Angeles, Seattle, New York and Boston. 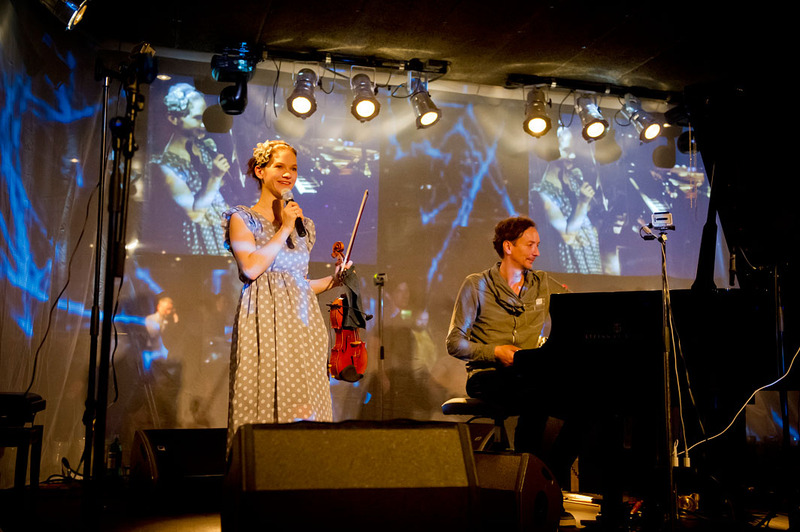 The violinist, wearing a polka-dot dress and matching headpiece, seemed to revel in the freedom of entering the percussive and melodic layers of Haushka’s sound world. From my seat on a short wall at the far corner of the stage (the small basement venue was packed to the point that oxygen felt scarce), I spied wooden sticks, duct tape and tin foil inside the grand piano. Hahn responded with an intuitive, relaxed air to the whirring textures emanating from the instrument, from brief melodic gestures to full-thrust harmonics, yet her immaculate technique was always present. As she admits in an interview with local magazine concerti, she remains a perfectionist. The pieces all last under ten minutes with the exception of “Godot,” a slow exploration of Hauschka’s raw industrial sounds complimented by whinnying and other timbral exploration on the violin. The musicians write that the track is hypnotic in surround sound, which I haven’t been able to test yet. “Halo of Honey,” dedicated to Brosseau, traps the violin in a ghostly netherworld against crinkling and muted, distorted piano. The final track “Rift,” referring to the “deepness and isolation” of the island of Silfra, creates a sense of suspended time and nostalgia before launching into a mesmerizing minimalist tapestry. Hahn and Hauschka open the album with the last track they recorded, “Stillness,” which hovers in the upper registers of the violin and piano only to fleet by like an afterthought. Such free collaborations are rare in the classical music establishment, and while it may take an artist of Hahn’s stature to find the backing of a label such as Deutsche Grammophon, it could set a precedent for other soloists itching to explore another side of their creativity. A spring tour brought Riccardo Chailly and the Gewandhausorchester Leipzig to the Konzerthaus this week, a rare occasion to hear this fine orchestra in the German capital. For a moment I lost my orientation, as I’ve never heard a guest orchestra on the stage of the East Berlin hall, and the Leipzigers’ incisive string playing made me do a double-take. The program, seen May 15, opened with Ravel’s Piano Concerto in G-major featuring Hélène Grimaud, elegant as ever in velvet pants and a fitted silver jacket. The French pianist gave a poignant, introspective account of the nocturne-like passage that opens the middle Adagio movement while Chailly stood with his eyes closed on the podium. He subsequently summoned graceful entrances from the winds, particularly in the flute and English horn solos, while the piano continued as if trapped in its own world. Ravel’s brief use of bi-tonality in this movement is one of its most captivating moments, and Grimaud did not wander from a tender but focused pianissimo. The opening Allegro, peppered with the quote of a falling melody from Gerschwin’s Rhapsody in Blue and jazz rhythms, received a vigorous if not muscular reading from the orchestra. Grimaud indulged in impressionist textures that, while evocative of the spirit in which Ravel synthesized the influences of his time into a personal blend, threatened to submerge the piano’s inner melodies in a bleeding wash of colors, such as through the passage of Spanish-inflected triolas in the section Meno vivo. While Grimaud’s ability to subsume emotion contributes strongly to her appeal, a bit more Sitzfleisch would have made the performance stronger. By contrast, she revealed a razor-sharp technique through the rapid chordal spans and arpeggiations of the final Presto, whose tempo Chailly kept particularly fleet. As a colleague noted, the brass could barely keep up speed. Mahler’s Fourth Symphony, also in G-major, created a more serene atmosphere for the second half of the concert. Following the Mahlerthon that occupied programming during the composer’s centennial last season, this work feels as commonplace as a Mozart Symphony, yet it is hard to resist Mahler’s delicious harmonies and searing Lebensschmerz, particularly in the inner Adagio. The Gewandhausorchester plays with a directness that nevertheless conveyed a sense of inner torment beneath the vital sheen of sleigh bells and nods to Viennese Classicism in the opening movement. The strings produced an even, warm pianissimo. Chailly created unbearable tension through his use of ritardando in the Ruhevoll (Poco adagio) movement, steering through tearful laughter before the gates opened for Das Himmlische Leben, a song from the Knaben Wunderhorn cycle. Soprano Christina Landshamer’s youthful, clear timbre captured the childish delight Mahler explicitly instructed, yet there was no sense of the subtle irony that emerges in a more dramatically nuanced performance. While she and Chailly gave clear emphasis to the final stanza’s critical line “Eleven thousand virgins/allow themselves to dance,” the delivery was almost too reverential, failing to provide a window into Mahler’s ambivalent spirituality. An elderly couple to my left was following the text with a nearly pious air, not sure whether to give in to the movement’s mordant satire. This entry was posted on Friday, May 18th, 2012 at 7:02 am	and is filed under Berlin Times. You can follow any responses to this entry through the RSS 2.0 feed. Both comments and pings are currently closed.